Drawing on personal conversations with the artist as well as original research, Michel Remy examines the life and work of the artist through­out her long career, from her passage through Cubism and abstraction to Surrealism, as well as her dedicated participation in Surreal­ist activities in England and abroad. Each period is illustrated with many striking images, including rare photographs, and supported by penetrating interpretations. The powerful myth-making drive that underlies Agar’s output is revealed, as well the tenderness, humour, poetry, love of nature and the world, subversion of the laws of reality, and celebration of femininity that suffuses each of her works. 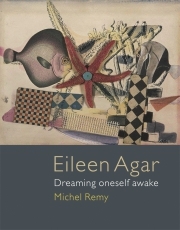 This is a timely, fresh and cogent account of a fascinating woman artist whose quality of work, independence of mind and freedom of imagination refute the assertion that women have not played a major role in the story of Surrealism. The book will appeal to anyone interested in art history and Surrealism. Michel Remy is Emeritus Professor of English Literature and Art History at the University of Nice, France. The leading authority on British Surrealism, he has published widely on the subject and has co-curated several Surrealist exhibitions in France and England. He is the author of many books, including The Surrealist World of Desmond Morris (1991), Surrealism in Britain (1999) and On the Thirteenth Stroke of Midnight: Surrealist Poetry in Britain (2013).